It costs $2,500 per student to participate in this week long competition trip. Our goal is to send each member of the choir (ages 8-18) on this once-in-a-lifetime experience free of charge to them. They have worked so hard to develop their performing skills, and we have no doubt they will make everyone in the Branson area proud of their achievement! There will be a sufficient number of adult chaperones and BRAC instructors joining them for security and support. Our total goal for this fundraising effort is $50,000, however any donation amount would be appreciated. Can you help make this National Show Choir Competion Dream Come True for our students? 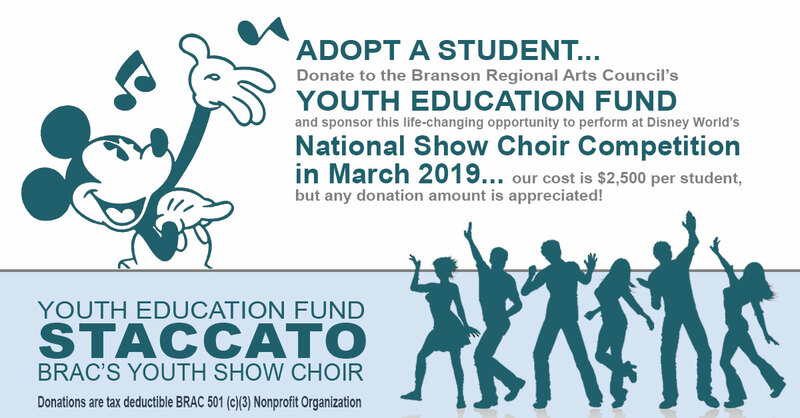 Please make a tax-deductible contribution using a major credit card via this order form link, or mail your personal check to: BRAC, Youth Education Fund, PO Box 2004, Branson, MO 65615.